The PhotoProShop is holding a special Thanksgiving Day celebration featuring 40% OFF on Nikonians clothing and a chance to get a classic "old style" Nikonians T-Shirt for just one dollar. Your Nikonians cap is already worn out and looks like you've attended to the last 500 ANPATS? This is your chance to get new and discounted products to show that you're a Nikonian. 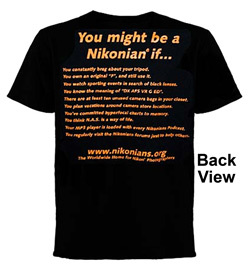 We have gathered up nearly 300 of our original "You might be a Nikonian if... " T-shirts and discounted them to just one Dollar each. Once these are gone, they will not be re-printed (they have the original "old-style" logo). The Thanksgiving Day Special includes 40% discounts on some of our absolute favorite Nikonians clothing such as the Nikonians Camouflage Cap, our new Nikonians Black/Gray Cap and the Nikonians Rain Jacket and Waterproof Photo Jacket. To see all of our discounted products click here. Your member discount code is available at your Nikonians Rewards page. This Thanksgiving Day Special is valid until Black Friday (29th of November). Remember, supply is limited, hence no rainchecks! Order yours today!